Now the Amazon Mom Service has a special offer for Members .New users can get a $25 Credit to use on Diapers just for signing up for a free 3-month trial! Sign up for Amazon Mom between October 28 and November 10. On November 18 qualifying NEW members will get an email confirmation for the $25 diaper credit. Use the $25 credit by December 18 to purchase a box of qualifying diapers with Subscribe and Save. The $25 credit will automatically be applied to your purchase when you check out. Are you eligible for the $25 off diaper credit? You must be a new Amazon Mom member with Amazon Prime to qualify for this $25 diaper credit deal. The promotional credit must be redeemed between October 28 – November 10, 2013. Limit one promotional credit per account for a one time use only. 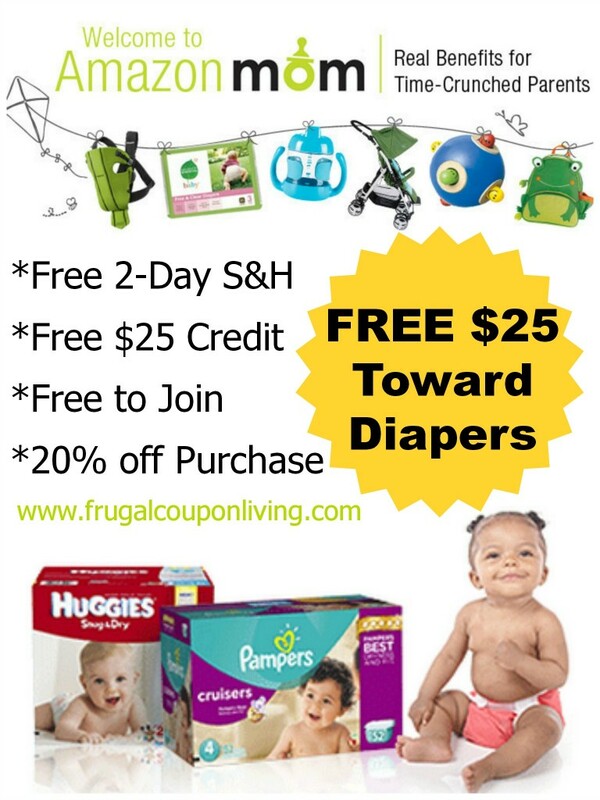 Head HERE to Sign up for the FREE Amazon Mom Service for 3 months and to snag the $25 credit for diapers! Find more Amazon Deals on Frugal Coupon Living!